You won’t live long enough to read all the survival books out there, so why not focus on the few that deliver a legitimate bang for the buck? There are three general categories Holistic Survival likes, each with it’s own strength, though you might want to steer clear of those claiming to teach you how to conquer a world gone mad with nothing but a toothpick and pen light. We’re into realism here and recommend the following as survival books that might really help you. Military Manuals: True, these are official government publications and we are normally loathe to believe anything from that source but…an ungodly amount of research goes into these books and the methods have been put to the ultimate test in battle. Another thing to keep in mind is that military manuals offer clear, actionable advice. The government has a vested interest in keeping their soldiers alive in the field. A random guide of edible herbs by Dude I’ve Never Heard Of would give us pause to consider. Survivalist Books: While it’s true that a large section of books by survivalists should be taken with a boulder of salt, there is real gold to be found there as well. Take a pass on sensational titles like How to Survive a Zombie Invasion and, instead, look for legitimate books by people who have actually survived the situation they’re writing about. Fiction: Books like The Road by Cormac McCarthy and some other end of the world scenarios make excellent chances to play “what if” games with yourself. How would react in a similar situation? While some of the ways fictional characters manage to escape death are not believable, and you shouldn’t follow their actions verbatim, almost any situation depicted could happen…some day…maybe. These are our category picks for survival books to put on your shelf and pass around to those you love and want to protect. 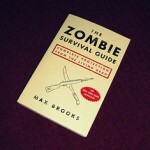 Leave the zombie killing guide for someone else.